To me, meditation is like taking a ferry: you feel like you’re not doing anything, but deep inside you realize it helps you get to where you want to go. Meditation also helps you overcome obstacles that may seem impossible, like crossing the Sound. However, there seems to be in insurmountable wall to actually start meditating; there’s always an excuse for not taking the time to do it. 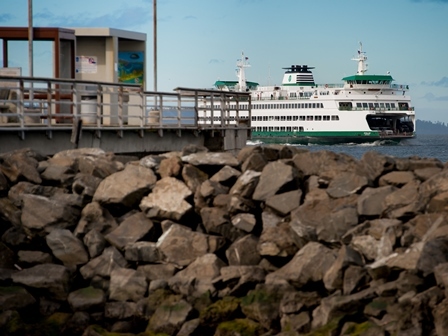 In this picture, the pier and the ferry seem to be just a step apart, like a person could simple step on to the ferry. But those on the ferry are much further ahead. By taking time to mediate we take the “busy-ness” out of our lives for a while. And when we cease activity, we have time to be still and listen.